There’s something special about a toy you build yourself—especially when it starts out as just a handful of electrical parts. From the creators of Makers Toolbox come two new DIY kits complete with all the components you need to construct a working Scribbler Robot or Proptractor. 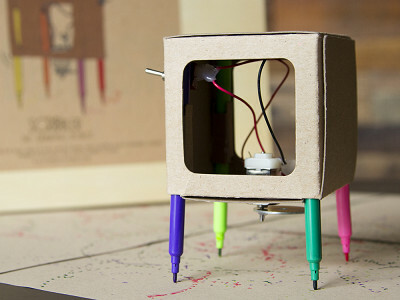 What exactly is a Scribbler Robot? It’s just what it sounds like—a robot that squiggles and scribbles, drawing designs as it moves across a piece of paper. And then there’s the Proptractor, an aeronautical vehicle that takes flight at your remote-controlled command. Founded in Brooklyn, New York by Mick Kelly and Sue Williams, Makers Toolbox creates toys-to-be for kids with an interest in learning how things work. In addition to designing and selling these inventive kits, Mick and Sue have delivered robot workshops to over 12,000 young makers in Dublin, Ireland. With the recent opening of ther Red Hook Makerspace in Brooklyn, their workshops are now available here in the United States as well. The Scribbler Robot and Proptractor kits make a great gift for tweens too old for conventional children’s toys but young enough to get excited and marvel at the power of inventing something with their own two hands. There’s something special about a toy you build yourself—especially when it starts out as just a handful of electrical parts. From the creators of Makers Toolbox come two new DIY kits complete with all the components you need to construct a working Scribbler Robot or Proptractor. 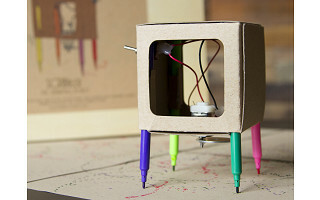 What exactly is a Scribbler Robot? It’s just what it sounds like—a robot that squiggles and scribbles, drawing designs as it moves across a piece of paper. And then there’s the Proptractor, an aeronautical vehicle that takes flight at your remote-controlled command. Founded in Brooklyn, New York by Mick Kelly and Sue Williams, Makers Toolbox creates toys-to-be for kids with an interest in learning how things work. In addition to designing and selling these inventive kits, Mick and Sue have delivered robot workshops to over 12,000 young makers in Dublin, Ireland. With the recent opening of ther Red Hook Makerspace in Brooklyn, their workshops are now available here in the United States as well.